Tree trimming can be a gamble. Wait too long and dead branches can fall on power lines, your home, car or other property. Hire the wrong company and these trimmed branches hit the same things anyway. At My Backyard, we understand that homeowners can have a stressful time choosing the right company. Trust the tree trimming Peoria IL counts on for safe and efficient services. Trust My Backyard. Credentials: A company can do a lot of damage if they’re new or don’t have the right knowledge. Insurance: Ask about the kind of coverage a company has in case something happens while they’re on the job. Don’t be held responsible for damage by poor insurance. Testimonials: Testimonials are the only way to truly know if the tree trimming service is legitimate. Don’t just take it from the business–look to see who has hired them and what they have to say. Our owner is a certified arborist and certified tree worker from the International Society of Arborists. What does this mean? It means that when you work with us, you’re getting an expert in the field. We’ve worked hard to ensure that the tree trimming you receive not only works for the present but is healthy enough to keep the tree around for years. Trust our tree health management services or our tree removal services as other great options for your yard. 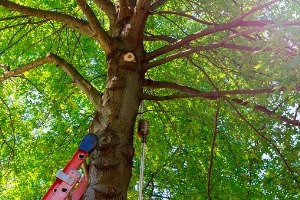 Don’t leave an important job like tree service to just anyone. For the most reliable tree trimming Peoria IL has to offer, give us a call or send us a text or email.